Leasing Services - Things You Should Know About Lease-Ups | Class Inc. 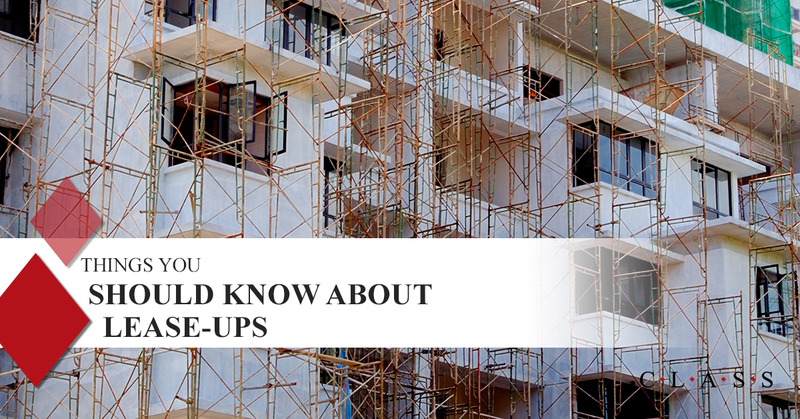 If you’re invested in the construction of new multifamily communities, it’s likely that you’ve frequently heard the term “lease-up.” A property lease-up is the time between a new apartment complex is built and the period of six months to a year after it opens. During this period, the community develops its brand, it’s presence in the town or city, and also creates various marketing and online campaigns. Navigating this period can be difficult, as it can be difficult to find residents while your community is leasing-up. To ensure that you successfully transition from new a new apartment community to an established one, Class Inc. has put together this list of important things you should know about lease-ups. To ensure that your community makes it through the lease-up period, it’s vital that you have a team of skilled and motivated individuals. You’ll want to make sure that you have a community manager who has experience, and is aware of the nuances of the lease-up process. In this transitory phase, you’ll want to ensure that all of your team members have the proper training. Part of working with a successful team means communicating with them frequently. You’ll want to ensure that every member of your team is on the same page, and that means informing everyone involved with your community of your goals, and progress. Reach out to your investors and keep them up-to-date with information about the progress that the construction crew has made, and vice versa. Make sure that everyone’s expectations of the project are realistic. Communication across your entire team will help your community open on time and lease it’s apartments quickly. The lease-up phase is the hardest period to market in. This is largely because your apartments may still be under construction, you do not have anything beyond renderings or drawings to show potential residents. That shouldn’t keep you from marketing, however. Highlight some of the most exciting features of your community, be it a pool, a theater, shared cooking spaces, or even walk-out patios. All of these things should make it into your marketing efforts. Online advertising is great, but you’ll find lots of traction if you market in businesses and retailers that are near your community. Not only can you advertise in these spaces, you can build relationships with these other businesses, as they’ll benefit from having new residents nearby. You can also connect with local media, like lifestyle magazines and newspapers to cover your apartments. There’s no denying that the lease-up period is one of the hardest in community management. You’ll need to utilize all of your resources and get creative with your efforts. But don’t despair! Your efforts will result in a vibrant and happy community, with every apartment filled with a satisfied resident. Make sure your community management team is ready for this challenging period by taking training courses on leasing services with Class Inc. We have more than 30 years of experience and can help you make the most of your apartment leasing efforts. Connect with Class today to sign up for your training courses!